Whew! we finally finished it! Little did we know that when we put out a call for orange cats on our Facebook page, that we'd end up with 105 orange lovelies to put in our slideshow. To make it properly slow, 50 would be about right, but our human decided she just couldn't leave out ANYONE. Of course we had to do all the work! 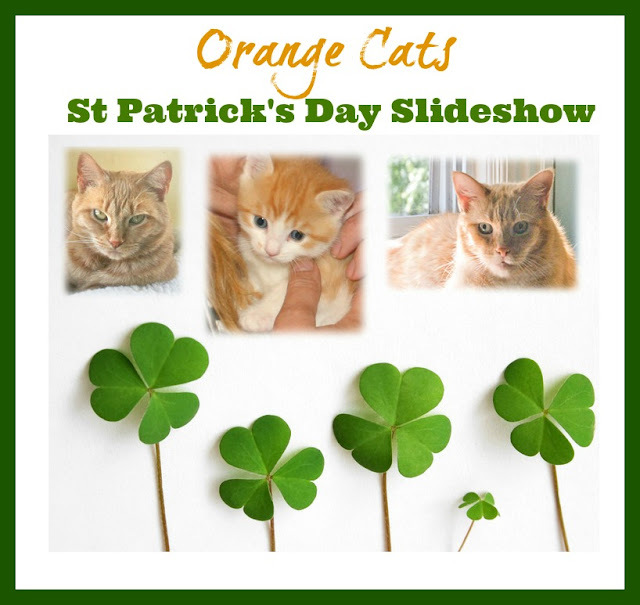 ANYhoo, hope you enjoy it - a lot of kitties and their peeps from our blogging community are in it! We're joining Cat on My Head's Sunday Blog Parade and invite you to check out all the other kitties and friends therein! Hope you all have a wonderful week... for certain, you should be able to with that many lovely orange beauties to admire. I can't see it. The link is taking me to my own You Tube page. This is so festive and fantastic! Ginger kitties are so special, and you sure did them proud here. Thank you for doing this, Peaches and Paprika, with certainly a little help from mom Carol! That was sure a mighty fine bunch of orange goodness!!! Thank you for sending the link. You did a great job. Great job with all the Ginger kitties. You do absolutely pawsome work. Paws up!! YOU did a fabulous job on the slide show and thank you for including us! What a pawsome slide show! Wally is so happy to be part of it. A magnificent slideshow.......I know it was a HUGE job but it really was amazing to see so many beautiful gingers in one place at one time! Thank you for including Angel Sammy and Teddy - it was just WONDERFUL. OMC! We have new baby Ginger NFCs and looks like we found our peeps!